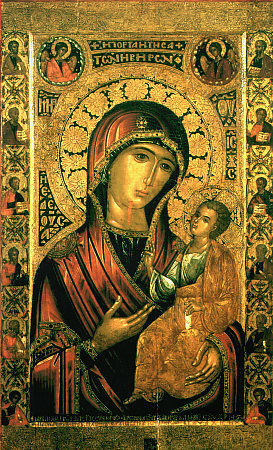 The Iversk Icon of the Mother of God (which at present is preserved on Athos) was in the IX Century situated with a certain pious widow, living near Nicea. During the time of the emperor Theophilos (82-842), the Iconoclasts in their attempts to abolish the veneration of holy icons, came to the house of this Christian, and one of the soldiers struck the image of the Mother of God with a spear. Where it was struck, there immediately flowed out blood. The widow, fearing its destruction, promised the imperial soldiers money and implored them not to touch the icon until morning. When the soldiers departed, the woman together with her son (later to be an Athos monk), sent the holy icon away upon the sea to preserve it. The icon, standing upon the water, floated off to Athos. The Athos monks, having for several days seen a fiery pillar rising up to the heavens upon the sea, came down to the shore and found there the holy image, standing upon the waters. After a molieben of thanksgiving for the monastery having been granted the holy image that thus had appeared, a pious monk of the Iveria monastery – Saint Gabriel the Gruzian (Georgian, Comm. 12 July) – had a sleep vision in which the Mother of God appeared to him and gave him orders, and so he went to the water and taking up the holy icon he placed it in the church. On the following day, however, the icon was found not within the church, but on the gates of the monastery. This was repeated several times, until the MostHoly Mother of God revealed to Saint Gabriel Her will, saying, that She did not want the icon as something protected by the monks, but rather She intended to be their Protectress. After this, the image was installed atop the monastery gates. And therefore this icon came to be called "Portal–Keeper" or "Gate-Keeper" (An account about this icon is located also under 13 October).